Our grocery store falls within the 3-mile radius of our house, which means it’s on my list of places to bike to. Originally I thought biking to do my grocery shopping was going to be a major ordeal. However, once I got in the rhythm, it’s actually been pretty uneventful. Below I’ve put a few of the lessons learned along the way. 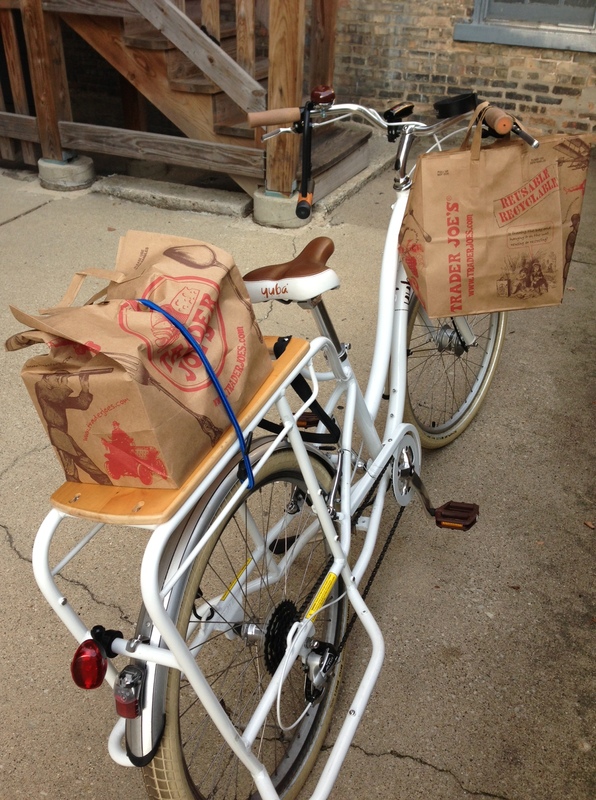 Grocery shopping without panniers (bags designed to hang on your bike rack) is simply a bad idea (see right). However, there have been times where I just need to grab a few items after work and I forgot to bring them with. I purchased an inexpensive pannier for $20 on clearance that I can just keep on my bike at all times. Of course, I also have the big waterproof pannier that came with my Boda Boda – which is wonderful, but I make sure to take it off when it’s not in use. If you’re looking to grocery shop, make sure you have adequate panniers! In addition to groceries you’ll have a wallet, a phone, and keys with you as well (not to mention a spare tube and pump if you decide to bring them). 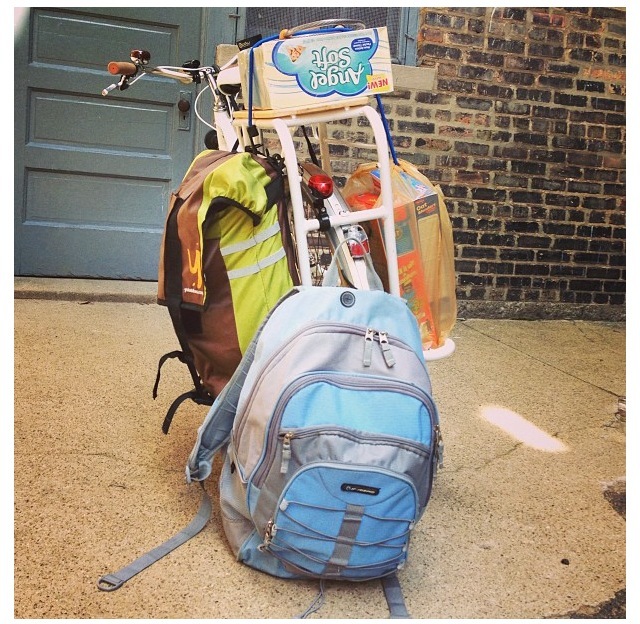 Find a backpack you can use for your bike grocery adventures that has plenty of space to be packed with groceries. Backpacks are also handy if you’re going to make a couple stops (if what you buy at the first stops fits in the bag). When driving, our grocery store trip includes a massive uphill climb over a bridge; this is a lot less enjoyable when weighed down with groceries. Know the route you’ll take back, not just figuring lights and stop signs, but climbs as well. Grocery shopping by bike does not need to be a big deal – you may even find a few things you like about it. 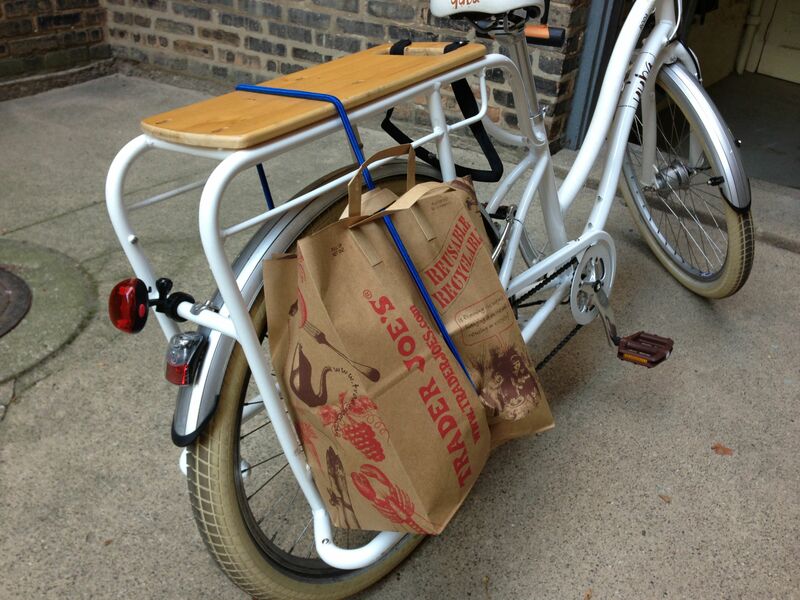 For example, I’ve found when I’m grocery shopping by bike, I am even better at sticking to my shopping list. (It’s worth noting that I’ve been told by other cyclists that when they’ve bought more than fits on their bike, most shops are happy to take the returns.) There’s also something about arriving on bike that causes me to make healthier decisions in what I pick – but that might just be me. I do all my grocery shopping online. This is such a great, insightful post. I find that this topic is one that I most want others to understand when they’re weighing whether or not to invest in this lifestyle. So many people feel burdened, bored, or blase about grocery shopping, and they don’t know that breaking it up and being able to enjoy the trip to and fro from a bicycle solves many of their problems. I love how you broke down what we need and how to conscientiously approach the task. Great work, again!